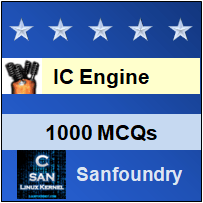 This set of IC Engines Multiple Choice Questions & Answers (MCQs) focuses on “Spark Advance Mechanism”. 1. The purpose of the spark advance mechanism is to assure that under every condition of engine operation, ignition takes place at the most favourable instant in time. 2. The engine speed and the engine load are the control quantities required for the automatic adjustment of the ignition timing. 3. The vacuum advance mechanism controls the ignition timing for full load operation. Explanation: In fact, the centrifugal advance mechanism controls the ignition timing for full load operation. 4. Vacuum advance mechanism shifts the ignition point under ____________ load operation. 5. The vacuum advance mechanism operates depending on the centrifugal advance mechanism. Explanation: Actually, the vacuum advance mechanism operates independent of the centrifugal advance mechanism. 6. The larger throttle opening means the possibility of better mixing and combustion during idling. 7. It is necessary to have centrifugal advance of the spark timing since the lean mixtures require an earlier spark timing than the rich mixtures. Explanation: Actually, it is necessary to have vacuum advance of the spark timing since the lean mixtures require an earlier spark timing than the rich mixtures. Explanation: The ignition advance is obtained with the help of a spring loaded diaphragm connected to the venturi and spring is not connected to nozzle or throttle. 10. The centrifugal spark advance is essential to compensate for the increase in speed of the engine.